If the computer device cant be fixed is there a charge...? - No fix no fee Do you offer free diagnosis...? How long does a repair take...? Do you guarantee the work...? Are the fixed fee's all that is paid...? Is there car parking available...? If I brought my laptop in the afternoon will it be fixed the same day...? Do I bring the charging adaptor too...? Do you really offer 24 hour laptop screen repairs...? What are the payment options...? The term “No fix no fee” applies if the engineer’s technical ability is unable to diagnose the reported problem, or if we're unable to source replacements parts to repair the computer device. If computer devices cant be repaired due to external dependancies or hardware software beyond repair then any chargable service is payable. Non repairs are generally without charge when computer devices are brought in to us, there's only charges for non repairs when either we provide collection and delivery services or if computers are custom/gaming types machines and just want the machine diagnosed for the customer to repair themselves. Do you offer free diagnosis...? Generally yes, PC FIX offers free inspections with a repair quotation for computer devices brought into our workshop, but Gaming and custom built machines incur a diagnosis fee of £29.99 only if the diagnosed repair quotation does not wish to be undertaken. This fee is for the reason of using our expertise and time for testing individual components to diagnose the fault for the customer to repair themselves, if they so wish to. How long does a repair take...? Repair times vary from a few hours to a few days. Generally we aim to repair devices within a day or two, it really depends on the type of fault, the parts required and the speed of the computer device, iintel 15 and 17 devices are very quick, as too are Solid State Drives, screen repairs can be done within 24 hours on business working days, and most laptop DC socket sockets are in stock this type of repair can be done the same day depending on the arrival time of course. Do you guarantee your work...? Yes we do offer a one year guarantee on new products such as Hard disks and Motherboard, we also warranty our work from 30 to 90 days depending on the type of repair and the suppliers conditions. Are the fixed fee's all that is paid...? The advertised fixed fees do not include parts which may be required and is an additional cost. Onsite repairs are charged on an hourly rate in blocks of 30 minutes then capped at 3 hours. Is there car parking available...? If I brought my laptop in the afternoon will it be fixed the same day...? Yes possibly, it really depends on the fault, the arrival time in the afternoon, the current work load and if the parts are in stock. Generally if you were to bring the laptop in the morning for a DC socket repair or an overheating maintenance repair it will probably be done the same day. For most jobs during the booking in process we can get an idea how long the job is likely to take to repair from the intial visual inspection. Do I bring the charging adaptor too...? Yes please, the charging adaptors are required, if it's forgotten or not available there may be one in stock, or a used one, but if not this would need to be ordered which will delay the repair for a couple of days. Desktop computers have a standard kettle lead which aren't required to be brought in. Do you really offer 24 hour laptop screen repairs...? Yes we do offer 24 hour laptop screen repairs for most repairs when laptops are brought to us before 1pm but aim for 24 hour hours for some repairs as we are only as good as the supplier’s method of postage service and depend upon the postal company used. We use several different suppliers when purchasing laptop screens. Royal Mail work hard to deliver our parcels within the paid for service time frame but even the extra paid next day 24 hour delivery service and first class services which do usually arrive the next day can be delayed a further day. This can happen if a new post person is employed and isn’t aware not to deliver before the business opens at 9:00am, consequently having to go to the delivery office the next day to collect, also the months running up to Christmas as expected is a huge strain on delivery companies. I know I had first hand experience of this as a delivery driver for City Link one Christmas season and understand the workings of courier company deliveries. Suppliers which use courier companies have the best delivery record; DPD and Yodel have fantastic app delivery timing. My Hemes and similar could be delivered any time between 9-6pm. UPS are starting from the Havering depot so this doesn’t usually get here until 5-6pm, a pretty poor service but If that supplier is the only supplier with the screen in stock at the best price what can we do? We do when possibile provide the tracking link on the online job sheet so customers can track the delivery progress too. 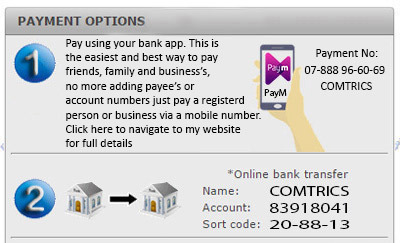 What are the payment options...?